PLEASE READ THE FAQ BEFORE YOU CONTACT US! 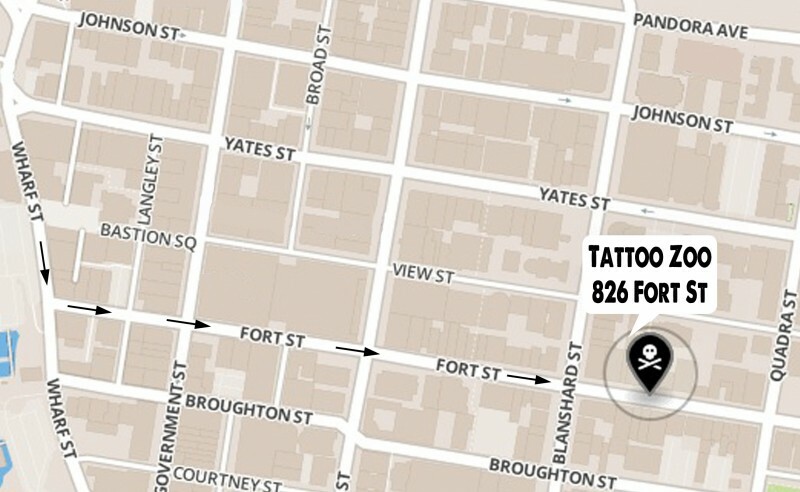 We are located at 826 Fort Street in the heart of Downtown Victoria. There is parking out front and a parking garage around the corner on View Street. If you have trouble finding us… just give us a call at 250-361-1952. You must be 18 years old (no exceptions) to get a tattoo. You must bring in valid photo ID. We won’t tattoo you without it. Can my parents/guardian sign for me? We don’t do piercing. I repeat. We don’t do piercing. At The Tattoo Zoo we provide you with all sorts of research material to look through that can help you find your design, or our artists can custom design something just for you. Remember getting a tattoo is about YOU. You are changing your body, for the rest of your life. So be smart and take your time deciding. Find an artist who you feel comfortable with, and check out their work. If you like the tattoos they have done in the past, then talk to them about your design ideas. Our artists are more than happy to help you design your tattoo. Or can I walk in? If you want to take your chances… sometimes you can get lucky if the guys aren’t busy. But if you have your heart set on getting tattoo’d on a specific day then it’s best to make an appointment. Give us a call at 250-361-1952 or come down to the shop to book an appointment. We require a (non-refundable) deposit that will be deducted from the price of your tattoo. If you are 15 minutes late or miss or cancel your appointment, your deposit will not be refunded. Think of the shop like a hair salon. We’re working on a schedule and can’t keep our other clients waiting. Being tattooed can be stressful on your body. You’re being poked with a needle and it can be emotionally and physically exhausting. Come in well rested and well fed before your appointment. Oh yeah… and don’t be late. A good tattoo should cost exactly what the artist’s time is worth. Tattoo Zoo charges by the piece so come down to the shop, and we can give you a quote on your tattoo. YES! If you’re happy with your service at Tattoo Zoo, tips are always appreciated. We accept all types of plastic. Interac & credit cards. We also accept cold hard cash!! Hell yes! But it hurts so good. Everyone has a different tolerance to pain, what might be painful for one person, is easy breezy for another. If you come in well rested, well fed and have a positive attitude… you will be fine. And if you’re good, you get a lollipop. Can I bring my baby/child with me to my tattoo appointment? We love kids but we ask that you do not bring your children. While you may have the most well behaved kids in the world … our shop is not the best place to hang out. It’s boring, loud and is not a good place to crawl around in while our artists are trying to concentrate. Thanks for understanding. Your tattoo artist will explain everything you need to know about taking care of your new tattoo. If you have any questions or concerns after your tattoo, just give us a call at (250) 361-1952. We practice the highest standards of sterilization in the industry, setting us apart from many other studios. We are licensed by the City of Victoria, do monthly spore tests on our autoclave equipment and we are inspected on a regular basis by the Capital Regional District Health Department.